King of California is a fable, a rose-coloured look at mental illness that responds to the soulless nature of contemporary culture. The bi-polar Charlie (Michael Douglas) gets released from a stint at a mental institution into the care of his teenage daughter Miranda, who in his absence has dropped out of school to work at McDonalds. Charlie is obsessed with finding a stash of Spanish gold abandoned by a failed conquistador during the 17th century. Miranda, despite her cynicism and a lifetime of disappointment at the hands of her father, gets roped into helping with his quest. Their prospecting takes them through the heart of corporate suburbia to their final excavation site in the middle of a Costco. 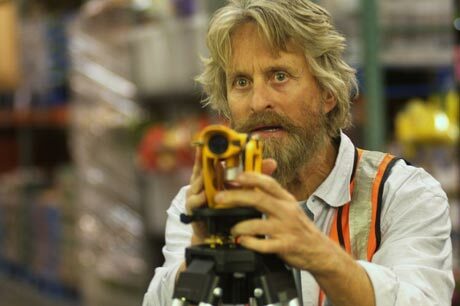 This is Michael Douglas at his wacky best, more Wonder Boys than Wall Street. His large performance overshadows Evan Rachel Wood, who underwhelms a bit as Miranda, delivering a flat voiceover narration and not completely selling the characters struggle with her difficult father. The films journey is endearingly eccentric, showing one mans refusal to believe or accept the change in the landscape and culture that America has endured in a generation.